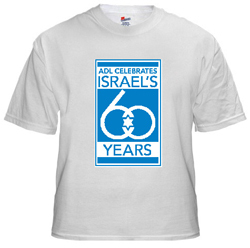 This 100% cotton, American-made shirt prominently features ADL's Israel 60 artwork on the front. An ADL logo appears on the back of the shirt. Click here for more information about ADL's Celebration of Israel's 60 Years.